Each of these helps not only protect drivers but also others working in areas shared with forklifts. There are any number of guard rail types to choose from. There’s steel rail, flexible polymer, and steel pipe – each offering ways to stop a forklift from slamming into equipment, walls, work zones, and pedestrians. The important element in selecting guard rail is to consider the forklift mass and speed traveled at. The heavier the forklift and the faster the speed, the greater strength guard rail you need. How well the guard rail is anchored is important, too. Floor anchors can take only so much impact from collisions before they pull loose, making any guard rail basically ineffectual. Each impact can weaken the rail itself and the anchors, so monitor your rails once an impact occurs. 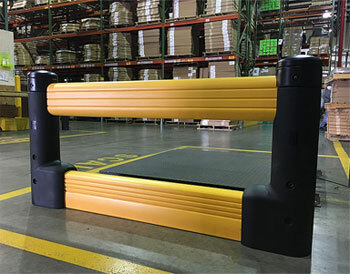 Additional guarding devices would include bollards for single point protection, rack and column protectors to reduce impact forces from pallet rack collisions and clearance bars (preferably a sensor type with lights and audible alarm) to protect door clearances. Hand rails are utilized to help control pedestrian pathways, but won’t stop or slow a forklift. Managing forklift traffic can be complicated at times depending on the number of forklifts being used, space density and workers sharing that space. To help mitigate the potential for collisions, traffic sensors are very useful. Choose to monitor dock doors, overhead doors, or general traffic. These devices detect traffic in the sensor range and trigger flashing lights to alert forklift drivers and co-workers of activity in that sensor zone. Another very popular product that helps pedestrians know a forklift is in the area is our Forklift Warning Light. It is a blue LED light focused to shine onto the floor about 15 feet ahead of or behind the moving forklift, warning pedestrians that a forklift is moving in their direction. The motion of the floor light is extremely visible. Much of forklift safety is directed at protecting people and property around the forklift, but drivers are at injury risk from falling objects and collisions as well. That’s why forklifts have roll cages and seat belts. Another way to protect your drivers is to add cab covers to your forklifts. These covers protect drivers from small particulate and granular debris that may fall from pallet rack or other storage where the forklift is operating. It also acts as a barrier from falling moisture and liquids. Another protective device, the forklift tine guide, not only protects the driver from falling debris but also protects goods. The tine guide helps the forklift operator better judge his tine height and position so that he inserts the tines into the pallet fork slots rather that into the cartons, bags or packages of goods stored. This positioning aid save you the cost of broken packaging as well as helping to prevent falling goods that might injure a driver. 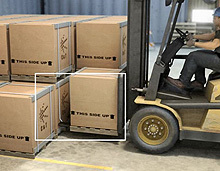 The next device protects ‘would-be’ drivers from unauthorized use of a forklift through the use of a lockout-tagout system that limits access to the steering wheel and gas pedal of a forklift. By locking out the forklift you help make sure only trained and certified drivers are operating your equipment. Nothing can compare to the value of proper safety training in the operation of a forklift. If your drivers aren’t receiving annual training, you are asking for expensive accidents. There are several companies offering forklift safety training and we can’t suggest strongly enough that you keep your drivers certified. 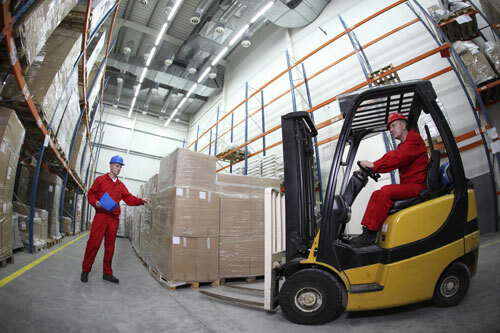 If there should be a forklift collision incident and OSHA becomes involved, forklift safety training will come into question and if you don’t have documented training in your records, you may face fines and penalties. Even non-drivers should be trained in basic forklift safety so they are aware of the massive impact a forklift collision causes. Prepare your workers in what to expect when working around forklifts, make them aware of preventive steps, and observe and reprimand careless behavior. Workers need to understand that being hit by a forklift is a deadly proposition. We often see forklifts being used for jobs they weren’t designed for, but there are some ways to make a forklift more amenable to additional tasks such as drum handling, carpet & roll transport, floor maintenance, towing, equipment lifting, pick operations, bulk goods transport and dumping. Jury-rigging some kind of contraption to adapt the forklift for these jobs is a foolish solution to your immediate needs. Rather, select specially engineered attachments for proper handling and task accomplishment. 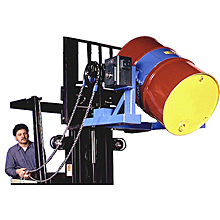 Some of these attachments include drum handling devices that lift, turn, rotate and pour drums. There are also special carpet and coil carriers that have spindles for more safely transporting these items. You can even get special sweeps bars that help keep floor debris under control. Towing attachments allow forklifts to pull trains of tow carts for more efficient movement of goods through a facility. Hoisting hooks and boom cranes help with lifting bulky items for re-location or positioning with less manual labor. Finally, there are pick cages, bulk containers and dumpers fitted with fork slots and engineered for use with forklifts to make those operations easier. Anytime a forklift is in operation there is a certain level of risk to your company. Reduce those risks through protective devices, effective safety training, well-thought-out traffic control and proper use of attachments for unusual loads. By implementing these steps, you reduce the risk of a deadly accident and serious injury to drivers and other workers in your facility. Protect your company from expensive lawsuits and penalties as well, but above all, protect people.